Aspiring and seasoned leaders have been trained to manage their leadership communication in many important ways. And yet, all their efforts to communicate effectively can be derailed by even the smallest nonverbal gestures such as the way they sit in a business meeting, or stand at the podium at a speaking engagement. 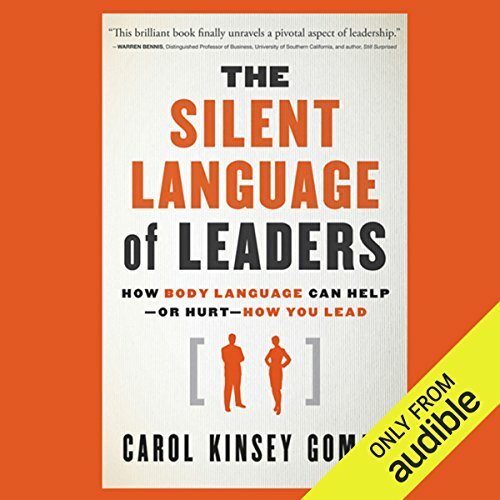 In The Silent Language of Leaders, Goman explains that personal space, physical gestures, posture, facial expressions, and eye contact communicate louder than words and, thus, can be used strategically to help leaders manage, motivate, lead global teams, and communicate clearly in the digital age. Draws on compelling psychological and neuroscience & technology research to show leaders how to adjust their body language for maximum effect. The Silent Language of Leaders will show listeners how to take advantage of the most underused skills in the leadership toolkit nonverbal skills to improve their credibility and stay ahead of the curve. ©2011 Carol Kinsey Goman (P)2012 Audible, Inc.
Not easy to follow the voice of reader is good for sleep. The content is not any thing you don't know. The author spends a good portion of the book adding in footnotes and content that add nothing to the subject matter. She also spends a good amount of time advertising for Cisco. The reader sounds a little drunk. I felt like the book was well written and well performperformed. It covered a lot of interesting information and added some great insight from a leadership perspective. Even if you have read other body language books, I still recommend this one. The only thing I did not enjoy was at the tail end of the book where the author goes into a lot of international advice and seems to get distracted in dealing with millennials and generational recommendations that don't seem relevant to body language. It seems like OK advise if you're looking for generational advice as a leader, but it did not feel relevant to body language discussions. Narrator makes this a difficult listen. The content of this book is fine. However, the narrator has an annoying verbal tick. Before many of the words, she makes a slight "emm" sound. It is as though the once had a stutter and has learned the technique of pre-starting words with this noise. It makes for a very choppy understanding as you cannot listen smoothly. What could Carol Kinsey Goman have done to make this a more enjoyable book for you? The sections on the question and answers with business people from around the world are VERY tedious to listen too. I sense that it would be much better if I could have visualized these sections on a page. Listening to them was tedious. Would you be willing to try another one of Vanessa Hart’s performances? No. Defintely not. She had the tempo of the reading wrong and an annoying verbal tick. Sometimes, it took my brain a couple of seconds to realize what word she had been saying. For example, if she was saying "Japan" it would be "a Japan" which wouldn't then make sense in the grammatical construction of the sentence. It was so hard to figure out what she was saying that I couldn't process the actual content as the narration went along. Who do you think would benefit most from listening to The Silent Language of Leaders? I wish I could return this book. Definitely not a good read. I couldn't deal with the narrator. Her manner of speaking sounds like she's trying to be an aristocrat. It's supremely annoying and takes away from the content. Could you see The Silent Language of Leaders being made into a movie or a TV series? Who should the stars be? It is a good read. I recommend this book. Where does The Silent Language of Leaders rank among all the audiobooks you’ve listened to so far? It is a good read. Most of the information in this book is general. But for the most part, worth listening/ reading too. What other book might you compare The Silent Language of Leaders to and why? Have you listened to any of Vanessa Hart’s other performances before? How does this one compare?